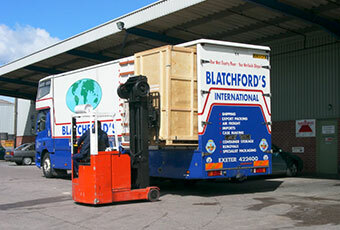 "Blatchford’s International is not just a removal company. We have over the years helped companies across the south west with specialist moves." We can handle any size move whether it’s a office printer or anything up to a large industrial machine we can help and take care of it all for you. We have in the past worked with the Royal Navy and arranged for the moving of a Rolls Royce Gas turbine engine used to power a naval Frigate. We have also worked with a Cornish based company with packing and shipment of a bottling plant to china. So if you or your company have a moving project and you would like some help and information then call us so as we can arrange to discuss the project and to provide a costing. "The Blatchfords family have been moving people and businesses safely across the UK and around the world since 1932."